Talking about race frequently takes the form of anecdote: “This happened to me,” or “That person made a racist remark.” Personal experience can be a relevant starting place when approaching a large, complex topic. However, conversation about race can remained focused on individuals when systemic inequity is the larger problem. How can diversity education convey this concept in a way that is accessible to a broad audience? At World Trust we are known for using the power of multiple personal stories, captured on film, as a doorway into the topic of racism. However, we present these stories in the larger context in which they occur, using a simple frame that explains the system of inequity. World Trust’s holistic frame shows the continual interaction between the internal (personal) and external (interpersonal, structural/institutional) manifestations of bias. The advantage of using a frame is that it applies not only to racism, but sexism, heterosexism, ageism, ableism — any attitude, action or institutional structure which subordinates (oppresses) a person or group — including bias against women who are overweight or men who are short. Once one is familiar with the components and how they work, it is possible to analyze personal anecdotes or media stories to understand what biases are at play and how they intersect. The system must be interrupted at both the internal and external levels for lasting change to occur. The importance of continual self-work to understand and heal one’s own internalized privilege/oppression is integral to the ability of workshop participants to analyze and dismantle systemic inequity. We offer this frame to support personal insight and renewal as well as to build capacity to analyze inequity in policy, law and institutions such as education, health care, corporations and the judicial system. 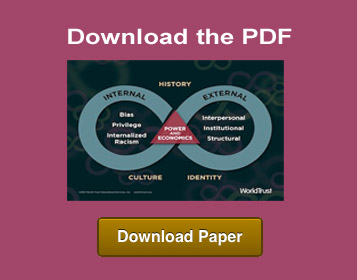 – Download a PDF of World Trust’s System of Inequity Graphic, and review a glossary of terms, to support your next diversity session. – Use the film Cracking the Codes: The System of Racial Inequity to introduce the concept of systemic inequity to groups. This film uses multiple personal stories to convey the internal and external components of systemic inequity, and how they are rooted in history and culture, and moved by power and economics. View the trailer. – Our resource for facilitators, Beyond our Wildest Dreams: Racial Equity Learning Modules, enables groups to go deeper into understanding systemic inequity, and develop skills to analyze and take action. Over 600 institutions use World Trust resources such as our film, Cracking the Codes: The System of Racial Inequity, to introduce staff, faculty and students to the concept of systemic, or structural, inequity. Learn more about our films and learning modules.